Cologne - Victory never looked in doubt for Borussia Dortmund and Eintracht Frankfurt on Bundesliga Matchday 32, but relegation-threatened Hannover 96 could only draw with SV Werder Bremen. Borussia Dortmund took another significant step towards securing European qualification courtesy of a 2-0 win over Hertha Berlin at the Signal Iduna Park on Saturday afternoon. Goals from Neven Subotic and Erik Durm either side of half-time were enough to dispose of the harmless capital city side, who mustered up just two shots on goal in the entire encounter. BVB wasted little time in asserting their authority on proceedings as they dominated possession, whilst keeping the deep-lying visitors pegged inside their own half. Therefore it came as little surprise when an unmarked Subotic broke the deadlock inside ten minutes, heading home the hosts’ seventh goal of the season from a corner. Dortmund managed their lead intelligently against a harmless Hertha side, who remained a goal down at the break having registered just a single shot on goal in the first half. The hosts’ grip on the game was only strengthened when, 76 seconds after the restart, Durm cut in off the right flank to extend the lead with a left-footed effort that nestled in the far corner. With Hertha offering nothing in the final third to threaten a comeback, Dortmund spurned a handful of half chances to put the game to bed. With just under ten minutes remaining, Thomas Kraft pulled off a stunning double save to keep the scoreline respectable with what proved to be the final goalscoring chances of a comfortable victory for the European hopefuls. Eintracht Frankfurt put an end to any lingering relegation fears thanks to a clinical 3-1 win at home to TSG 1899 Hoffenheim. Goals from Bastian Oczipka, Haris Seferovic and Timothy Chandler capped a dominant first-half showing, with Hoffenheim unable to turn the tide despite pulling one back through Kevin Volland. Frankfurt were rewarded for an adventurous start when Oczipka nestled a wicked free kick into the far corner after 17 minutes. The visitors had a glorious chance to level moments later, but Kevin Trapp denied Adam Szalai one-on-one, with Roberto Firmino heading over on the follow-up. The Eagles doubled their lead with their next attack as Seferovic collected Marc Stendera’s fine through-ball and dispatched beyond Baumann. Hoffenheim fell further behind before the half was out after Chandler glanced in from Oczipka's cross. Markus Gisdol’s side gave themselves a lifeline early in the second half as Volland thundered in an unstoppable free kick from 20 yards. Steven Zuber tested Trapp, but Frankfurt's defenders otherwise had little to do and saw out the remainder of the contest with minimum fuss. The result means Thomas Schaaf’s men are mathematically sure of a place in the Bundesliga next term, but leaves Hoffenheim needing a massive stroke of luck to qualify for next season’s UEFA Europa League. Hannover 96 wasted an opportunity to move out of the bottom three after being held at home to a 1-1 draw by SV Werder Bremen. Lars Stindl gave the rejuvenated Reds the lead in the first half and Michael Frontzeck's men appeared to be on course for victory until Zlatko Junuzovic broke their hearts with a late leveler. Hannover came into the game with their backs to the wall, but a short training camp in a local cloister appeared to have soothed them spiritually and removed all of their negative thoughts – only positivity was oozing from their game. 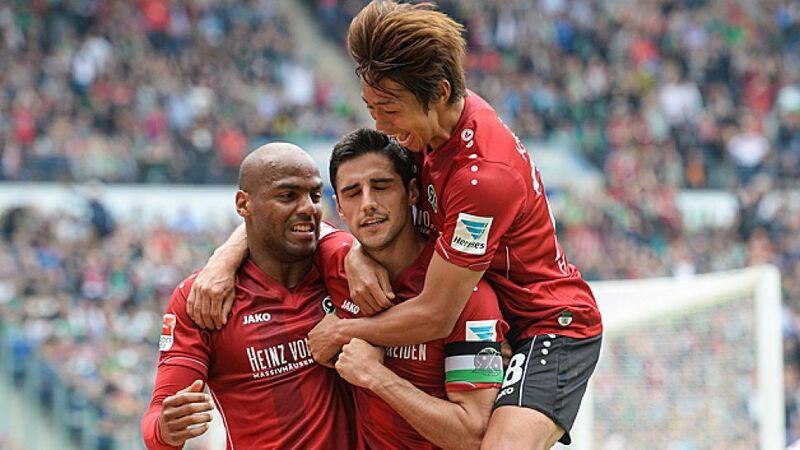 Jimmy Briand nearly crowned a dominant opening before Stindl showed him how it should be done, giving Hannover a deserved 21st-minute lead. Hiroshi Kiyotake hit the post moments later, although the linesman's flag was raised anyway. Koen Casteels kept out Briand's next chance in the second half before clutching the ball to his chest from a Salif Sané header. Hannover were eager to get a second, but instead they conceded in the most predictable of manners. After conceding a free-kick 25 yards from goal, the Hannover fans held their breath as set-piece specialist Junuzovic lined up his shot and consequently curled his effort past Ron-Robert Zieler. It denied Hannover a first win of 2015 and left them languishing inside the bottom three.